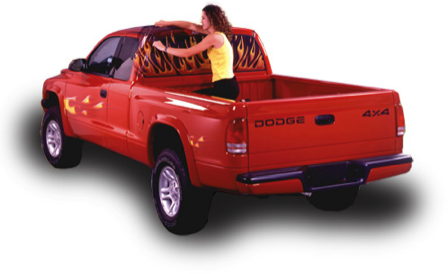 WindowCanvas features one of the largest selections of rear window graphics in the industry. Combining the latest in digital printing technology and the designs you want! Our images feature the hottest outdoor art from artists like The Hautman Brothers, fresh designs from our own graphic designers. WindowCanvas: it turns your window into art! WindowCanvas is a leader in next-generation personal, artistic expression, boldly declaring your personal ideals using today’s popular “canvas”, cars, trucks and SUV’s. Window Canvas designs and manufactures a huge selection of see-thru graphic images of wildlife, art, flags, breathtaking scenery, personal life-style imagery and much, much more. WindowCanvas has licensed designs from one of the biggest names in outdoor lifestyles: The Hautman Brothers and more! Installing a WindowCanvas designs is a pretty simple process. The perforations in the vinyl prevent the film from getting bubbles in it. ; making the installation easy as 1-2-3. WindowCanvas stock designs are printed and shipped within 3 business days of ordering. Many even go out the next day. And if we don't ship it in that time frame, we will eat the freight. How is that for a guarantee?